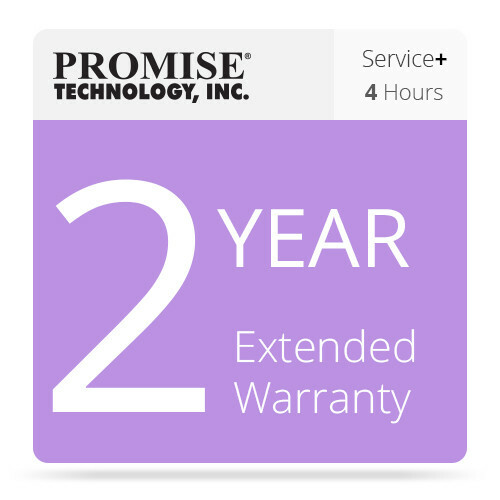 The Promise Technology 2 Year Extended Warranty + PROMISE ServicePlus Plan (4 Hours) provides you with a 2 year extended warranty that includes the PROMISE ServicePlus Plan. Also called PSP, this service offers replacement coverage for defective parts that can be replaced in the field without requiring the unit to be returned to the factory. Covered parts include drive modules, RAID controllers, and power supplies. This warranty service is for a period of 2 years beyond the original 3 year warranty included standard with the item, for a total of 5 years of warranty coverage. Replacements are done by onsite service personnel who will also haul away the defective components for you. This service is available 24-hours a day, seven days a week for the entire warranty period.